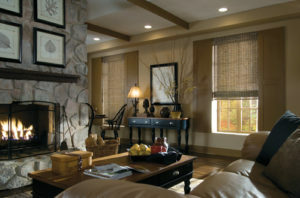 You are here:Home Window Treatments What Is the Focal Point in The Room? What Is the Focal Point in The Room? When you walk into a room, your eyes automatically go to a certain item or area in the room. In your room, what are your eyes drawn to first? The focal point in a room is defined by how the furnishings are arranged around it. If it is the window, the furniture should be placed around it, so it becomes the magnet in the space. When there is no window with a view, the TV, fireplace, piano or wall unit becomes the focal point. If you arrange the furnishings around the art, you just created a focal point. In the fall, the focal point might be the fireplace or TV. In the spring, the window might be the main focal point in that space. When planning your space, plan around two focal points. Changing the focal points twice a year is better for the wear and tear on your flooring and it brings families back into the space for new conversations and activities. There are general rules about decorating your windows, so that they are attractive from the inside and the outside. They will either be an attractive element of design in the room or the focal point. Is it attractive, or does it need to be played down? If it needs to be played down, you can add outdoor mood lighting or perhaps a fountain or sculpture. Adding lighting creates mystique, shadows and interest both inside and outside. Play with it and see how you feel at night when it is on. Always start by treating the window as a function first. · Who will be operating it? · Which side do the pulls need to be on? · Is child or pet safety a concern? · Do you have windows that are hard to reach or up high? · What window coverings do you currently have on the other windows? 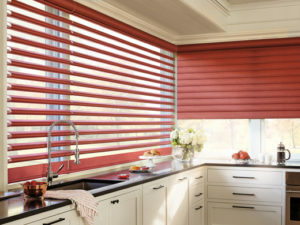 Cordless and motorized blinds and shades are available on virtually every window treatment in the Hunter Douglas product offering. Windo VanGo and Hunter Douglas take child and pet safety very seriously. Because the window in a room lets light in and carries a strong line, both vertically and horizontally, it is first noticed when you enter a room, especially if untreated! Stand outside and look at your windows. They don’t all have to be the same window covering, but it helps if they are the same color and carry the same lines. Vertical products can open in the middle, go to one side, or totally disappear. Perfect for large windows and patio or sliding doors. 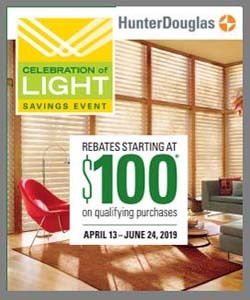 Some of the vertical products from Hunter Douglas include: Duette® Vertiglide™ Honeycomb Shades, Skyline® Gliding Panels and Vignette® Modern Shades. Horizontal products offer a variety of options such as the top-down/bottom-up operating feature. Top-down/bottom-up shades provide more options for letting light in or keeping it out. They work well in kitchens, bedrooms and bathrooms. Some of the Hunter Douglas horizontal products include Duette® Architella® Honeycomb Shades, Solera® Soft Shades, and Provenance® Woven Woods. Windo VanGo is your premier Hunter Douglas Window Treatment specialist and supplier of Farrow & Ball premiere paints and wallpapers in the Baltimore, MD, area, with a gallery showroom in Marriottsville. We serve the counties of Baltimore, Baltimore City, Howard, Carroll, Hartford, and Anne Arundel including Ellicott City, Randallstown, Owning Mills, Timonium, Westport, Forest Hill, Annapolis, Bethesda, Chevy Chase, Gaithersburg and surrounding areas.